After i succesfully installed the gnome variant of antergos I found that the system ignored the keyboard setting that I chose during install. But I also am not able to select the swiss german keyboard in Region und Sprache. 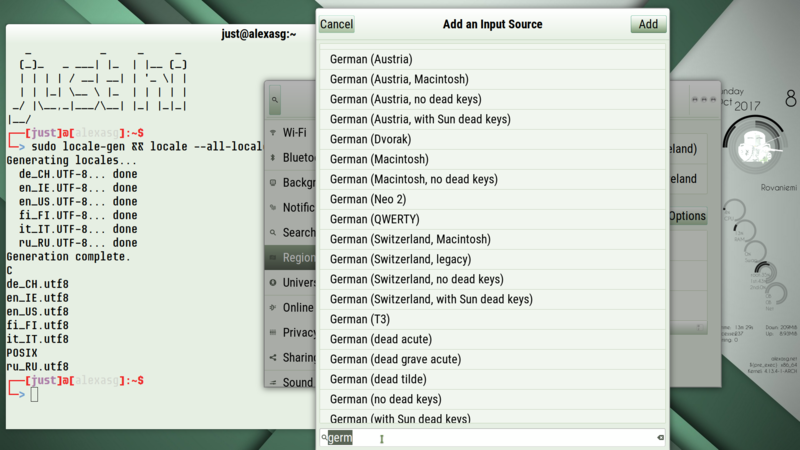 Is a swiss german keyboard not supported by gnome, antergos or the GUI? uncomment the line with it in the /etc/locale.gen file and regenerate locales. It will make it available in GUI only. It doesn’t set the keyboard layout for terminal and VTs. It is set through /etc/vconsole.conf file. @theking2 BTW. The logon screen uses the proper keyboard layout. Switch Sprach back to Englisch, and Logoff Logon. Dispite wrongly translated message in German it is not needed to restart the computer. Uncommenting de_CH UTF-8 adds a whole lot of German locales. I don’t speak Deutsch, so have no idea which one you’re interested in. I’ll comment out de_CH again. It’s Arabic for me. …I might want a Dutch user-interface with a Swiss - German keyboard. No problem. You may have a GUI interface in any language you want, and the keyboard layout - in any other language. Just enable all locales you wish to use. 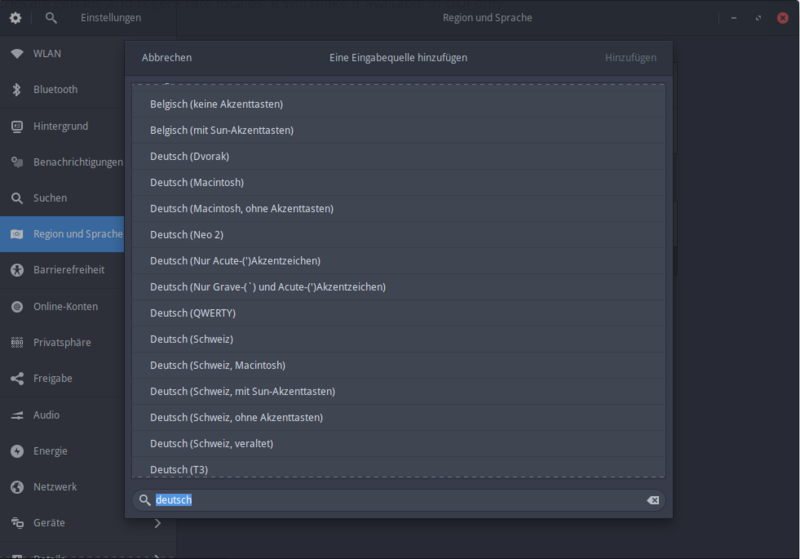 Simply set Region & Language --> Formats to Dutch, and Region & Language --> Input Sources to Swiss-German. Done. Dutch and Swiss-German loacles must be enabled in /etc/locale.gen. For example, usually my GUI is in English (US) and the keyboard is with Italian layout. Sometime I switch to Italian GUI with English (UK) keyboard, configuring some system for my daughter. Or in English (US) GUI with the Russian keyboard layout, for my dad. GUI language and keyboard layout are unrelated between them and may be set independently one from another. @just You’re right. But I have to vi /etc/locale.gen first, change the language, logoff/logon, and only than can change the keyboard, and have to change the langauge back causing another logoff/logon. I call this a work around. Not very user-centered. Considering that I selected the right keyboard layout in “cnchi” in the first place. I’m not annoyed, just puzzled. @theking2 Once locale(s) are changed in /etc/locale.gen and regenerated with locale-gen, they become available immediately, even in the current X session. @just Not true. I have to change the language which causes me to logoff and logon. Simple: In Region & Language I see the English keyboards when the language is English and I see the German keyboards when the language is set to Deutsch. Really. I will give antergos another go when the beta-bugs are dealed with. @theking2 but what you show on the picture is language setting not keyboard setting. Language is relative to what you generate with locale-gen. I don’t think it is a cnchi related issue. I had been using Antergos for several months and suddenly my keyboard-layout was changed after an upgrade (previous to gnome 3.26) on two different computers. My systems are in English, but I use the spanish-la layout. Now this option disappeared.